Last night, Jason and I tried out a new recipe! We both thought that the picture of it looked good, and even though we didn't know of anyone else who had tried it, we decided to give it a whirl. 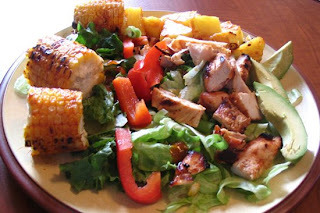 BBQ chicken, corn and pineapple with raw pepper, green onion, avacado and lettuce. It has a BBQ sauce (with additional ingredients) used for basting, and then the same sauce (with less additional ingredients) used for drizzle (salad dressing). We're going to try another recipe tomorrow - a BBQ burrito! I woke up wobbly, and tired. So as you also can probably guess...I haven't done anything today. We're having left-overs for dinner, and then we'll watch a movie. I'm just walking around in a fog. I can't seem to concentrate on anything for too long, and my body is tired. Here's another recent pic of myself, 2Penny, Nickel and Jason. Ok, all for now...dinner time! I'm not going to set my alarm clock on Saturdays and Sundays...or any other day that ends up being a part of a long week-end or holiday. I didn't want to get up this morning. Actually, when I went to bed last night, I didn't want to get up this morning. I'm tired. But, I got up, ate my breakfast, and put on my walking clothes. This time, I showered when we returned from our walk. We also took bottles of water with us...the sun is hot! So far today, I don't have a "burst" of energy to sustain me for the rest of the day. I napped for an hour and half...and before I fell asleep, I told myself that I would get out of bed when Jason did (he has to return to work)...and I did. Yesterday, we ended up not walking at all. It was muggy out when we had finished dinner, so we watched the Blue Jay game instead. What I neglected to mention is that I got an extra bit of a work-out on Monday evening. A work-out for the arms..at least! Jason and I played boxing on our Wii. It was my first time trying it out, as well as tennis. The boxing involved a constant flailing of arms (or at least that's how we played)...real boxing movements, without the resistance of hitting something (or someone). My arms are still paying for it! I have to go for yet another "extra" blood test this week. Despite the hepatologist seeing me, and saying that all is good...my MS doc feels that the blood work from June 13 is a significant increase from previous. So I have to go again this week (instead of one month from the 13th) to make sure that the 13th was not the beginning of a "big jump". Going for a blood test isn't a big deal. Repeatedly going for blood tests, thinking that one day the doc is going to yank me off my Rebif is what I don't like. I just want anything involving MS treatment to be a silent part of life...not a constant question. As it's been, for the past two years, everyday, I shower...just not always at the same time. I get up sometime in the morning, but sometimes I return to bed if I don't feel well. I have been waiting for the "healing" process to finish. I was told that my brain suffered a major assault, and it would take time to heal. Well I'm tired of waiting...I think that the healing is over. This is what I've got to work with. So, like everybody else, I'm going to try and be responsible. I'll get up at the same time everyday, eat and shower as if I have to leave the house (or go to my home office) for work...no languishing or lolly-gagging. Weather and wobbles permitting, I'll go for a walk with Jason in the morning. If it seems hot and/or muggy, I will hold off the walk until the evening. It's summer time, so I have to add flower pot maintenance to the household chores. Yup, this is me trying to feel important...with a routine. Nothing to lose, lots to gain. I have almost completed the first day of my "routine". I awoke. We walked. We shopped. I slept. I got up this morning at 9:00 - beep, beep, beep, cried my alarm. I padded down the stairs in a bit of a fog. I had just slept for ten hours, and wanted more. But I pushed through, eating my cereal, feeding Nike...all the while wondering if I should go back to bed. I felt a slight wobble in my world. When Jason got home from work, we went for a quick walk around the block. It was already getting hot out, and when we returned, I had worked up a sweat. I really despise my damaged thermostat. I am always hot - it's a bit of a joke around here. Anyway, I'm not going to bore you with a play-by-play of my day. You just need to know that I napped from 1:30-3:30. And at 3:30, I curled up on the couch, and watched two hours of television. Then tonight, I dead-headed the flowers, watered the flowers, and watered the new sod. Right now, I'm tired. A normal tired, not fatigued. It's two minutes to needle time...gotta go. I have finally completed my application for CPP disability benefits (Canada Pension Plan). As part of the contract with my long term disability "supplier", I have to apply for CPP. I began this process in early April. Part of me didn't want to apply because it feels as if I am conceding to the disease...or at least admitting that something awful took me down two years ago. I don't want to be part of an association between MS and an inability to work. That is not the face I want to give this disease. But...it is the reality, for me. I have been unable to think clearly, constructively, continuously, and completely (heeheehee this post has been brought to you by the letter "C") when filling out the application. Unlike the "focus on your strengths" life mantra, the application focuses on what you can't do...your limitations. So I called in Ladyfingers to help me. We have spent much of the past month analyzing and writing. Ladyfingers went through this process herself...more than once. The process has been like writing a sad memoir...I blurted out words and descriptions, and Ladyfingers made it all make sense. Yesterday, I put the last thoughts to the keyboard. I had to describe my limitations regarding my personal needs. As I re-read what I had typed, I was hit with a wave of sadness...for myself. I realized that I have been living like this for two years, and I no longer think about the specifics. It was just the way I do things...it's how I deal with day to day life...I no longer do things like everyone else does. The whole application was full of sadness! Personal needs: I eat very slowly. Food gets stuck in my throat. Chewing also makes me tired. When I shower, I hold the wall to steady myself. When I get dressed, I guide my right leg into my pants. A couple of days a week, I lie down after my shower because I am fatigued and/or dizzy. I used to spend time after the shower styling my hair and/or putting on make-up, but I don’t do that anymore. But somehow, I have gotten used to the way I do things. These adaptations to my life don't make me sad (or at least not persistently sad). Or at least not until I think about them. Earlier today, I had an idea for a post - and now it's gone. I'm going to put myself on a schedule. Instead of getting up when I decide to get up, I am going to get up every morning at the same time...regardless of how I feel. I will get up, have my breakfast, have a shower, and by then, Jason will be home from his morning shift at work, and we will go for a walk. If I am not up to it following my shower, that's ok. If I need to go back to bed after my shower that's ok too. That is the schedule I'm going to start with...I have to start somewhere. I finally settled on this decision because I am still grasping for what my "purpose" is. My newest diagnosis has created some bumps in my life...the "new reality" that I was just starting to get used to. Instead, it feels as if my life just got more complicated. I mentioned before that I have been struggling with not being able to work, and not being a mother either...what am I if I am neither? I'm anxious to figure that out! I know...I know...it will just happen...but I do believe that we have some control. If I have a routine, maybe I will feel more important. Not that I don't feel important...purposeful is more like it...a contributor...in control. How is that for "various thoughts"? For the past few days, I have had the wobbles in the morning. Sometimes, I go back to bed for a couple of hours, and everything is fine. I have also been taking two Bonamine tablets to settle things. The ENT doctor suggested these tablets instead of lorazapam. If I remember correctly (and I don't always), the active ingredient in Bonamine is meclizine. The wobbles could be caused by a tossing-and-turning sleep. They could also be caused by stress...which could also cause the poor sleep. I'm going to cut it short right here, because you get the picture. If I am going to go through all of this crap...then damn it, I'm going to be inspiring! *Jason and I often refer to past events in relation to "when I got sick". At some point, this is going to have to change, but I don't know how else to describe the event of two years ago (yes, this week marks the second anniversary of my attack). I feel as if "got sick" implies that I am still sick...and I'm not sure about that. I am definitely "changed"...but sick? I am somewhat of a perfectionist. I also have very definite likes and dislikes when it comes to design oriented elements regarding our home. We are currently adding some more "landscape" elements to our front yard...some needless to say, I have a vision. But my physical and mental energy is limited. So instead of looking for the "perfect" element...just the right colour, just the right size...a perfect cover for the freshly soiled lawn...I settle for the best of what I have been able to view. That's it. Instead of hunting through multiple garden nurseries, and searching bags and piles of mulch, I declared a "cease" action. I suggested to dude, that he can go and pick up the mulch that I saw at the first nursery (I only went to two, and only one of them had bulk mulch)...it would be fine. This morning, I had my appointment with the hepatologist. I wasn't scheduled to see him again until December, but the my MS doctor is concerned with my liver enzymes. But the wonderful hepatologist says that everything is okay...no need to be yanked off the Rebif. And hey, I'm down a few pounds since I saw him last...exactly as he ordered. *yes, I did say "wonderful hepatologist". I really mean that. He's quick and to the point, but also friendly and funny. Yesterday, I received a call from my nurse at the Multiple Support Program (provided by the drug company). She calls me periodically to check on things. I mentioned that everything seems to be going well, except that every injection area has at least one red blotch on it. The blotches aren't tender to the touch, but when you can't inject in a red area, it limits how many places you can go. When she asked me how long they last, and I said about two weeks, she said that if they ever seem to not go away at all, I have to let my doctor know. I do have one blotch that is a couple days over three weeks old. But it is finally starting to fade, so I'm not going to worry about it. It was from the first time that I ever injected the Rebif into my stomach. 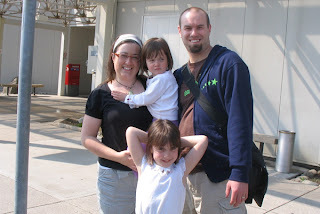 Annie, Jason, and I were at the Toronto Jays game on an injection day. I carried my needle in my purse, as well as a cotton ball, and my needle clipper (a handy little device that clips and stores the needle tip) and went into a bathroom stall when the time came. How is that for shoot-and-go?! Shockingly, the Rogers Center did not have a needle disposal container in the washroom. So - all good news. I can stay on my Rebif. I'm happy for that. It means that we are one step closer to some consistency in my life. I'm just stopping by for a quick note. I survived my procedure - as far as I am concerned, the stress of it has not had an impact on my MS symptoms. I also awoke with all of my abilities! Thursday ended up being a long day, as the laproscopy showed some things of concern to my doctor, and he arranged another procedure for me, on the same day. I'm having trouble with words right now...I know what I want to say, but I can't seem to transfer the thoughts to the keyboard. I have pushed myself harder than I should have for the past two days. I never want to miss anything, and I like to have a least one hand on the steering wheel (so to speak). So, I'll try to come back here soon...when I feel that I can make more sense. Here I am - back home, and maybe I can get back to posting. Or maybe not yet. Tomorrow, I'm having day surgery...and the word is I may be uncomfortable for a couple of days after. Also, there is a chance that my MS symptoms may flare up. Apparently, people with MS should consider whether or not elective surgery is necessary. I'm assuming a flare up would be a result of stress. I am not really afraid of a flare up of symptoms. What I am afraid of is that my abilities might be altered following general anesthetic. I met with the anesthetist yesterday, and he assured me that the risk of this was small (less than 3%), and that there are no other precautions we could take to decrease this risk even more. My liver enzymes keep climbing - so my MS doctor is sending me back to the hepatologist. That appointment is next week...instead of the scheduled follow-up for December. Ladyfingers and Dude are in town! They arrived last night, and have settled in nicely. Flowers, yard work...'tis the season! Well this is all that I have for now. I hope that is sun is shining where you are!